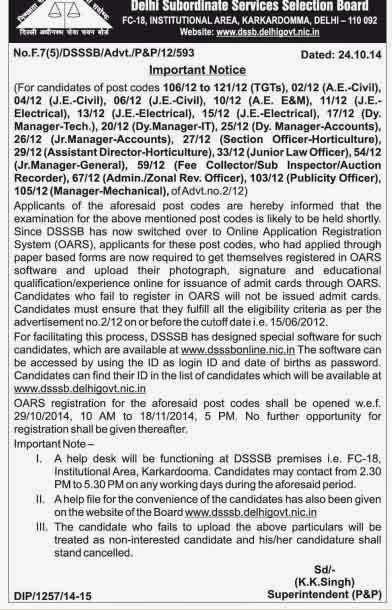 Delhi subordinate service Selection board DSSSB published the official notification no Dated: 24.10.14 No.F.7(5)/DSSSB/Advt./P&P/1 2/593 for inviting the application form once again for which you filled offline paper based application form . Applicants of the aforesaid post codes are hereby informed that the examination for the above mentioned post codes is likely to be held shortly. Since DSSSB has now switched over to Online Application Registration System (OARS), applicants for these post codes, who had applied through paper based forms are now required to get themselves registered in OARS software and upload their photograph, signature and educational qualification/experience online for issuance of admit cards through OARS. Candidates who fail to register in OARS will not be issued admit cards. Candidates must ensure that they fulfill all the eligibility criteria as per the advertisement no.2/12 on or before the cutoff date i.e. 15/06/2012.